This is LunaPic's Fairy art filter. We've used it before and we love it! You look just purrfect, Athena! Athena looks so lovely! and LunaPic is a great find, I'm trying it out now! You are one beautiful tabby, Athena! We miss your green eyes though! Athena! Yous looks marvelous! The Fairy Filter is terrific. We has missed pawticipating and is happy wes could this week! That is stunning Athena. Absolutely stunning. i'll have to try that one sometime and see how it is with a black and white kitty. 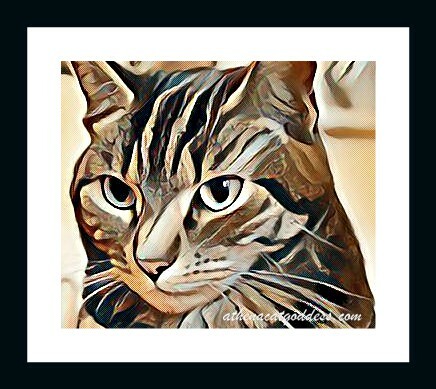 It's a very cool filter, and perfect for your tabby fur, Athena! Athena you make a great fairy. We are happy to be joining you for the Caturday Blog Hop! You are a very pretty fairy Athena! You are as lovely as ever, Athena! We just love when you use the fairy effect, as it suits you so purrfectly. You are the fairy queen of beauty Athena! That's such a nice effect....we need to remember to try it. You look gorgeous! I like that filter. I've used it but still haven't published the art.